Welcome to the first of a new online monthly series of columns aimed at understanding electronic sensors as they are applied to tool and die protection, in-tool part-quality monitoring and plant-wide value-added operations. Back in 1984, I first began to teach and write extensively on this topic and continued to do so regularly for several decades–until a few years ago. Lately, however, I have encountered many new employees in the metalforming industry, quite a few of them relatively young and with little personal experience with electronic sensors. But I’ve found them hungry for more enlightenment on the fundamentals and, more importantly, the specifics of implementing these electronic sensors within tooling. It is primarily to these new members of our metalforming community, be they in management, engineering, production, quality or maintenance, that I am dedicating this column. I invite comments and questions, and will do my best to answer them in a timely manner. Properly selected, tested and implemented electronic sensors do much more than simply protect a stamping tool from damage or destruction from material or human error. Electronic sensors also patrol part quality, increase press-stroke speed and allow for multiple presses to be run by one individual. And there’s more. They extend the life of presses and minimize their wear; minimize sharpening of dies and tooling; dramatically increase the overall equipment effectiveness (OEE) of the presses; and, overall, help maintain a tight delivery process that can meet the most stringent just-in-time (JIT) requirements. The earliest U.S. patent that I can find relating to die protection with sensors was filed by the prolific inventor George Wintriss in 1959 and granted in 1962. 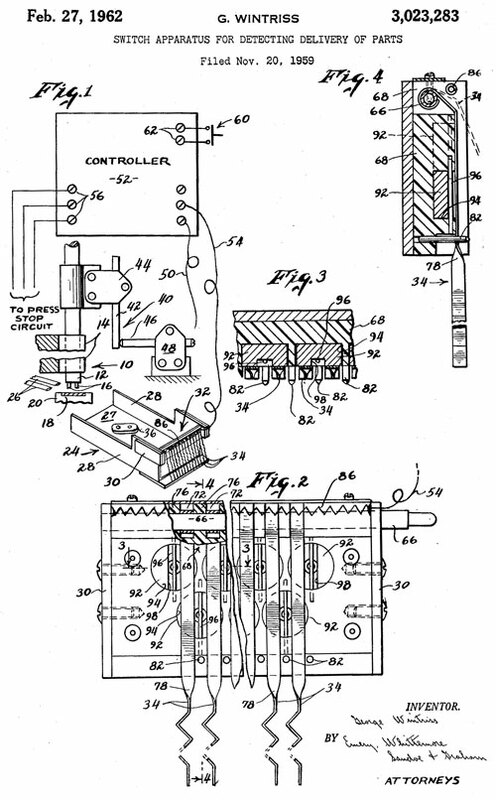 His patent (pictured), “Switch Apparatus for Detecting Delivery of Parts,” details the detection of parts leaving a die with mechanical contact probes (he called them feelers) monitored by an electronic circuit. The apparatus employs vacuum-tube circuitry (I have the first model on my desk). This circuitry controls power to the stamping press. If the contact feeler probes don’t detect part ejection, the press is stopped. This prevents a double hit where two parts may be smashed into one another, possibly resulting in severe die damage. Below is the patent diagram. If you are curious about the patent itself, it can be viewed here. In Wintriss’ patent, his feeler probes are held in place with magnets (number 92, for example, as shown in the patent image). Does this sound familiar? Have you seen contact probes (whiskers, feelers, etc.) mounted on magnetic chucks at the end of a die for the monitoring of the feed or part-out functions? Using mechanical grounding probes to detect a part-out, strip-feed or cam-return function represents technology that is nearly 60 years old. If you’re wondering if these probes really work, of course they do. But…and this is an important but…they are adjustable at the whims and interpretations of the press operator. In my many years of experience, I have seen such mechanical part-out probes bent so that they would touch the upper die instead of the exiting part with every closure of the die, eliminating nuisance stops due to an oily exiting part not making a proper electrical contact with the probe. Likewise, for feed sensoring, contact probes are bent to detect a short or long feed as a correct feed, thus fooling the control into permitting the press to cycle. The control system is fairly stupid. It has no intelligence to differentiate between a well-adjusted mechanical probe and one that is lying. As of yet we have no artificial intelligence in our die-protection controls. Is the company detecting material feed and part ejection using mainly mechanical devices such as variations on spring probes, grounding blocks and coil banding, or does it use electronic noncontact sensors or a hybrid? If using primarily electronic sensors, are these sensors buried within the tooling, for the most part invisible, fully protected by a cocoon of tool steel and unadjustable by shop-floor production personnel? Are all of the sensor cables routed within channels milled into the tooling and/or within robust tubing to protect them from short-circuit- producing cuts and rips? Are the sensor cables routed to a centralized connector mounted within a small box on the die itself, or do multiple cables hang from the tooling, perhaps plugged into a series of sensor-connector blocks mounted on the press frame? Does an electronic control (off-the shelf or home-built) monitor the sensors and make the decision as to when to stop the press due to a detected error? Is the die-protection system supplemented with a properly calibrated tonnage monitor that reports press force with every stroke? Is any of the above partially or fully plugged-in and actually being used? Question no. 7 may sound far-fetched and possibly funny to some readers, but I can assure you, many times I see sensor and tonnage-monitoring systems either turned off completely or partially, or simply not used at all. In extreme cases, the die-protection control system is used as a glorified parts counter with the tonnage monitor turned off completely or with its limits set to infinity. The next installment of this column will focus on inductive-proximity sensors, with explanations and illustrations detailing applications within dies and other types of metalforming tooling. Future columns will explore photoelectric sensors, strain gauges, gas and fluid pressure sensors, and more. Welcome to MetalForming magazine’s monthly, online-exclusive Metalforming Electronics column. For more than 30 years, George Keremedjiev had authored the Metalforming Electronics column in MetalForming magazine and continues his efforts here. He regularly consults with metalforming companies worldwide and provides metalformers with training on the application and implementation of sensors for die protection. For more information on his seminars and consultancies, contact: Tecknow Education Services, Inc. P.O. Box 6448 Bozeman, MT 59771 phone: 406/587-4751 fax: 406/587-9620 www.mfg-advice.com E-mail: gk@mfg-advice.com.